Are you looking for a company that offers mattress cleaning services in Kensington? Our advice is to take a look at our company. Throughout the years we have proven that we are very adept at mattress cleaning. We demonstrate great skills, attention to detail and work ethics. Our cleaning program is high-quality. It is designed to remove not only grime, but also dust mites, bacteria, human and pet hair and other stuff. We have professional equipment, we operate 7 days a week. Our call centre serves customers 24/7. Don’t hesitate to give us a call whenever you can. 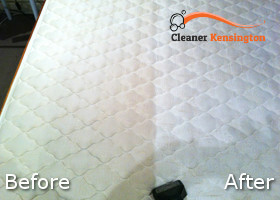 Our mattress cleaning service in Kensington is so detailed that it produces long-lasting results. Your mattress will look and smell clean in the weeks to come. Of course, it depends on how you use it. It is vital to have professionals clean your mattress year round, especially if you suffer from asthma or have other allergic reactions. Dust mites can worsen the symptoms and put your health at risk. That’s why you need to ensure that your mattress is free from allergens. 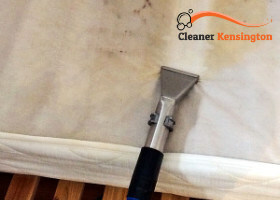 As an experienced provider of mattress cleaning services in Kensington, we should tell you that cleaning a mattress is not that easy, but we always use the best methods and tools to get rid of mites, bed bugs, dust, dead skin cells, etc. We use different methods to deal with the contaminants we mentioned above. It largely depends on what type of mattress you own. Steam cleaning is one of our favourite methods. In addition, we will treat any stains with our powerful cleaning products. In the end, your mattress will be all clean and safe to use. We obtain maximum results. Put your trust in us and we’ll show you that it’s worth counting on us. As we mentioned above, our phone lines are available nonstop. Don’t forget to call us.